Qutb Minar and its monuments is a group of religious and funerary buildings that display the architectural and artistic achievements of early Islamic India. They are located in South Delhi. Quwwatu'l-Islam mosque, the earliest extant mosque in northern India. 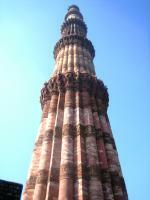 Qutb Minar, a red sandstone tower, 72.5 m high. Its construction was started around 1202 by Qutbu'd-Din Aibak, the first Muslim Sultan of Delhi. It has five storeys, and is the highest stone tower in India. Iron Pillar, built during the Gupta Empire in the 4th century AD. It is made of such pure iron that it has never rusted, a standing testimony to the metallurgical skill of ancient Indians. This was the first stop on my full-day tour of Delhi sights. The complex has a serene atmosphere, enhanced a little by the famous Delhi morning fog. You can sit on park benches and take in the views to these old constructions. There were about 20 other western visitors around, more than I had seen at any sight outside of Delhi. Focal point of the complex obviously is the enormous minaret. You only really feel how broad and tall it is when you're standing next to it. A magnificent piece of work. And then there's the enigmatic Iron Pillar. It looks so out of place here, in this whole complex full of brick and sandstone buildings. It's a very thin pillar, surrounded by a fence to protect it. It looks like if it was placed here only recently, as the start of a modern construction. Another monument that I enjoyed here was the Tomb of Iltutmish. It's a bulky structure when looked at from the outside and it is missing its roof. The interior however has lots of fine carvings, both in red sandstone and in white marble. I visited this WHS in January 2012. 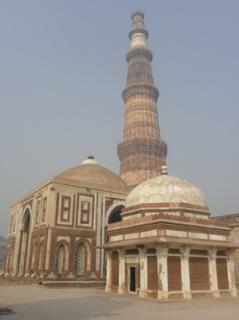 The 72.5m red sandstone and marble Minaret alone, already deserves being inscribed in the list. The intricate carvings with arabic calligraphy and islamic symbols are truly incredible and can be seen from every angle adorning the tallest minaret in India. The rest of the site is made up of interesting remains, tombs and an early mosque. Qutb Minar and it's monument's in Delhi is amazing although there has been some canges over the years for example you can't try to put your hands on the Iron Pillar beacause theres a gate around it. But the rewrds are amazing it's basiclly a complex so expect 1hour-1 and a half hour to explore the whole thing. The admission price for this monument is as falows,250 Rupees for all adults, children are free. Having muscled through the traffic of central Dehli to the southern suburbs, I found myself at the Qtub Minar, the 73 meter high minaret and one of the true landmarks of the city. Whether it was really meant as a minaret or just a watch tower seem to be still under discussion but it was unquestionably built in the late 12th century by Qutub-ud-din Aibak. Standing next to the Quwwat-ul-Islam mosque and many other temples in a nice park, it's a peaceful excursion that could last you an hour or two. And while you are there, don't miss Ala-ud-Din's unfinished minaret, meant to be twice as high as the Qtub Minar, but left at 27 meters at the time of his death. its a magnificient site to see. Qutb minar is one of the most incredible monuments.its amazing that it is still standing today after so many environmental problems. The Qutb Minar complex is an incredible self-proclamation of Islams arrival in India. When you consider the age of the Minar itself it makes it all the more impressive. The unrusted ancient iron pole at the site is a wonderful unsolved mystery. How can iron be so pure that it doesn't rust? Pillars: The "non rusting" Iron Pillar. Although often called an "Ashoka Pillar" it is not. It bears an inscription which states that it was erected as a flagstaff in honour of the Hindu god, Vishnu, and in the memory of the Gupta King Chandragupta II (375-413). Thomas Cook Round the World tour 1872-1873: c Feb 1873 "Delhi is one of the most interesting places in c Feb 1873 "Our good friend, Mr. Smith, is a power in Delhi, both in spiritual, sanitary, and social affairs. He spent a day with us in a visit to Kutuh, 11 miles distant, where there is one of the most wonderful obelisks in the world, surrounded by ruins of the greatest antiquity and interest." Ibn Battuta: "In the northern court of the mosque is the minaret, which has no parallel in the lands of Islam. It is built of red stone, unlike the stone used for the rest of the mosque, for that is white, and the stones of the minaret are decoratively carved. The minaret itself is of great height..."
Fatal Accidents or 'disasters': A "stampede" of Schoolgirls inside the tower occurred in 1979 when the power inside the tower failed leading to 20 deaths and its subsequent closure to the public.